As most of you all know, Jake and I moved to Seattle. I wanted to take the time to research ethically made & fair trade furniture, so that we could invest in quality pieces that would last us and feel confident in making these large purchases knowing our furniture way ethically made. Shopping for fair trade furniture can be a big investment we took our time, took advantage of seasonal sales, and learned that some furniture brands have payment plans which allowed us pay through monthly payments. Watch the video to see what I learned and read below for some of the ethical furniture brands we purchased from & resources. 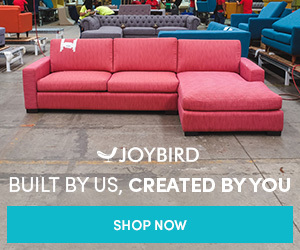 Joybird’s made to order furniture is crafted using responsibly sourced materials. With each furniture order Joybird plants tree as part of their give back initiative. So far Joybird has planted over 400,000 trees! Joybird’s has corporate headquarters in Los Angeles, a warehouse distribution in San Diego, and manufacturing facilities in Tijuana, Mexico, this ethical furniture brand is working to reduce their carbon footprint & help grow local communities by providing well-paying jobs, benefits, and a positive work environment. We ordered the our media console from Joybird and I am in LOVE with it. The Simic Media Console is a gorgeous, yet practical piece made from walnut wood. We love the sliding doors that allow us to hideaway our board games, movies, and more. The mid-century style fit well with our apartment. West Elm has a FABULOUS line of fair trade and sustainably sourced furniture, bedding, and home decor. Seriously, their choices are gorgeous, although pretty pricey. Shoppers definitely get what they pay for with West Elm. We purchased fair trade & artisan made rugs, fair trade & organic bedding, a sustainably sourced coffee table, a fair trade dining table, & sustainably sourced desks from West Elm. And we have been SO pleased with the quality. Like WOW. Beautiful pieces & incredibly durable. After having our furniture for eight months, I can tell these pieces are built to last. I love that West Elm really tries to make the furniture buying experience educational for consumers. West Elm’s Responsible Retail Glossary is an incredible tool for shoppers. This glossary breaks down the symbols and vocabulary found on West Elm products including fair trade, artisan made, sustainably sourced, and more. The “Our Commitment” page is incredibly helpful too! AND when we received our pieces each came with a tag explaining the social impact it had. Our fair trade rug came with a picture of the artisan and explained how fair trade makes a difference. I am really impressed with what West Elm has to offer. It’s refreshing too see a big name brand taking strides to educate consumers & be socially responsible. Specific West Elm pieces from our Home Tour video: Bedding, Dining Table, Coffee Table, & Desk. While we didn’t end up purchasing any furniture from Etsy, they have an excellent selection. They have a lot of furniture made from reclaimed wood. We are looking at purchasing shelves, frames, and art from Etsy. Etsy is a great place to support small businesses and makers, while finding unique pieces for your home. I purchased the organic wool bar stools from Wayfair and our couch which as made in America. When purchasing from Wayfair try looking for made in America since they do not have too many specifics on the ethics of their pieces.